Planet Mars is considered a fiery planet. It controls the blood pressure and temperament part of a human. If there will be arguments and fights in any family, the marriage may not survive. The placement of planet Mars in anybody's chart in Twelfth, First, Fourth, Seventh and Eighth house makes one Manglik or if the Mars is placed in these houses, the person is suffer from Manglik Dosha or defect. Now let how this Mars will hurt the matrimonial life depends on its location in the chart. If the planet Mars is placed in twelfth house of the birth chart, the native may have extra marital affairs leading to divorce or separation. Now when the planet Mars is placed in the First house, the native can have bad temper, always arguing with life partner or everybody, ready to fight and can even get physical with spouse. Now if the planet Mars is placed in Fourth house of the birth chart, There is no peace or harmony in Marriage. Both are always arguing and fighting and sometimes the fights or the arguments start from kitchen area. This person may not have too many friends either. If the planet Mars is placed in Seventh house of the chart, the health of spouse will suffer and the spouse will have a bad temper and ready to fight all the times. 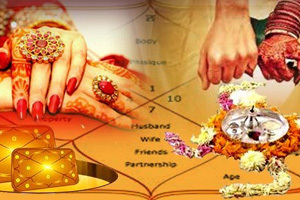 Now if the planet Mars is placed in eighth house of the birth chart, The marriage breaks because of outside influence in the married life, means the spouse may get involved with some one outside marriage or in-laws may have too much influence in the marital life ultimately leading to divorce. The similar position of the planet Mars from Moon in a native's chart is also detrimental to one's married life but up to a lesser extent. This placement of Mars in Twelfth, First, Fourth, Seventh or Eighth house from Moon is also known aqs CHANDRA MANGLIK. So in case compatibility the Placement of Mars is checked not only from Lagna but Moon also.